We may not be Mexican but we live in the southwest and Mexican food is one of our favorite foods. You can pretty much put anything in a tortilla and call it a burrito, and don’t think I haven’t. I am always trying new things with the same old food I create. With a family of 6 and so many different food preferences we tend to eat the same 10 meals over and over because nobody fights about them. If I can put those same ingredients into a different meal it somehow feels like I am not eating the same foods over and over, at least to me. The other night I needed a quick dinner and I was ready to make up some bean burritos when one of the kids wandered through the kitchen and asked if I could make quesadillas instead. I didn’t have the right ingredients for my regular quesadillas but I could improvise, thus the Crispy Quessadilla Pie came to my mind. This recipe is so simple and begs to be improvised upon. If you don’t have chicken, use pork. If you like pinto beans better than black beans add them instead. If you have some fajita veggies around they would be wonderful in this pie. It is your dinner, be creative! 2 cups cheese, use whatever kind your family likes. My family likes co-jack so that is what I used. Spread melted butter around the sides and bottom of a pie pan, using a pastry brush. If you wanted a lower fat recipe you could do spray oil here instead, but you are only putting 1/2 tbsp on and the butter will taste so much better. Lay one tortilla in the pie pan and press into place. 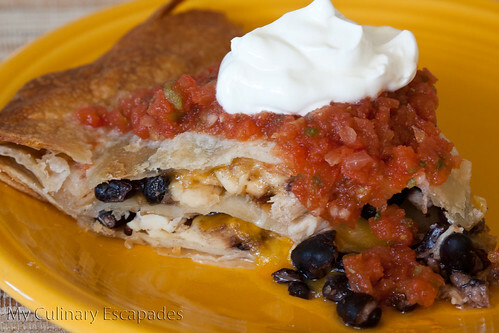 Top with 1/2 cup of chicken, 1/4 cup of black beans, and 1/2 cup cheese. Layer another tortilla in the pie pan and top with an additional 1/2 cup of chicken, 1/4 cup of black beans, and 1/2 cup cheese. Top pie with another tortilla and press into place around the sides very gently. Brush top of tortilla with butter. This recipe makes 2 pies so you will need to repeat the above steps to make a second pie. Slice each pie into 6 pieces and serve with sour cream and your favorite salsa. Don’t forget to have a slice of Margarita Tart for dessert.